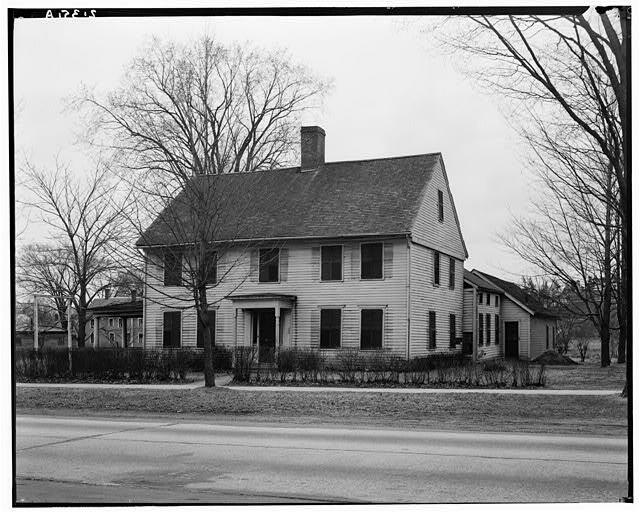 Here is the Arnold House around 1933. And below is the measured drawing of the front done at the same time for the Historic American Building survey, a project of the WPA. The drawings and picture are available at the HABS website. In the upper left corner of the drawing I have added the 3-4-5 triangle with its 90*, right angle. To see why I think this house was designed using that ratio see the previous post, Arnold House, Part 1. Click on the illustrations to enlarge. On the left side I have drawn in red dashed lines the 3-4-5 triangle using the first floor as the base and the ceiling of the second floor as the top. A house-wright would have used that line to determine his top plate. See (A). 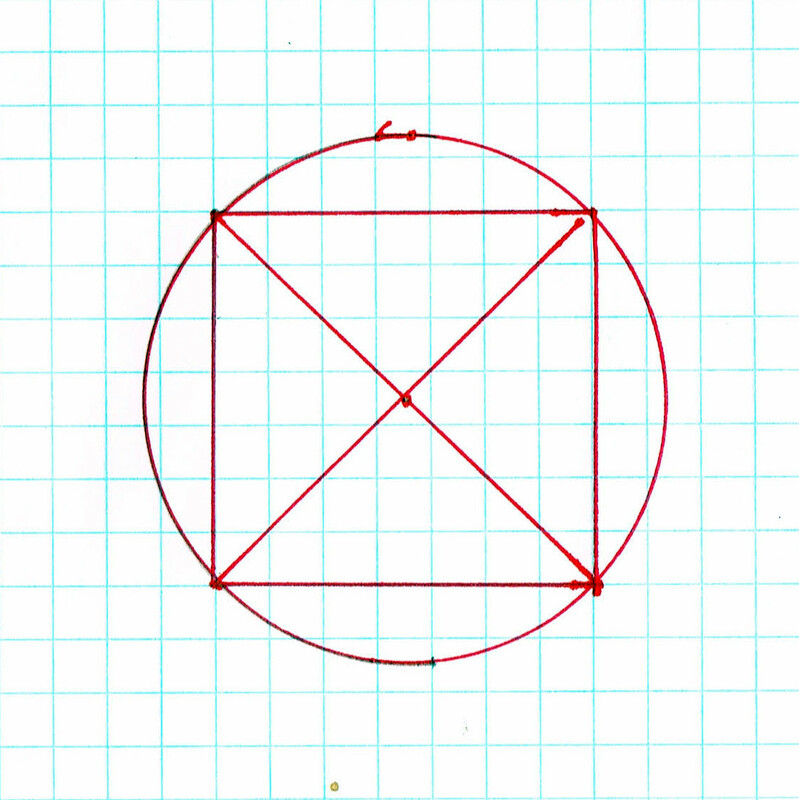 The center of the resultant rectangle is marked by the red 'x'. The 'x' is the location of the second floor beam. The right hand edge of the rectangle is the edge for the door, telling the framer where to locate the rough opening. The windows and doors do not appear to be determined by the elevation, but by the plan. 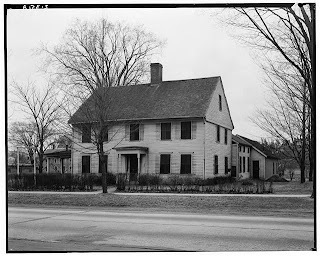 See my earlier post on the Arnold House - Part 1. As drawn on the right side - see (B) a red dash and dot line - the space on either side of the door is a square. But the windows are not symmetrical within the box. I tried using the Golden Section. It doesn't fit. 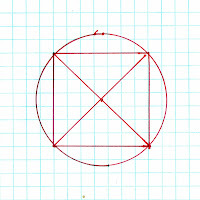 Circle geometry - here a circle based on the square - almost fits: several inches too large. Here I used the 'face' of the house clapboard from foundation to eaves, as I think the concern of the master carpenter would have shifted from framing to presentation - how the house appears to the community. 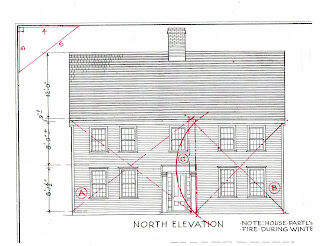 Two squares with the arcs from their circles would have fit across the front of the house, meeting at the middle of the front door IF the house had been 9" longer - 40 ft, not 39'-3", a true 3-4-5 rectangle. Was the foundation not true? The house-wright inexperienced or lax? If the wood was green would it have shrunk 9"? Or? For reference I have added a diagram of a square with the circle whose radius is half the square's diagonal. This house is no longer there. I would very much like to be able to see it,walk through the rooms, sense the proportions. I want to know if it feels differently because the ratio is mathematic, not geometric. The 3-4-5 triangle is not the Root-Two Rectangle. 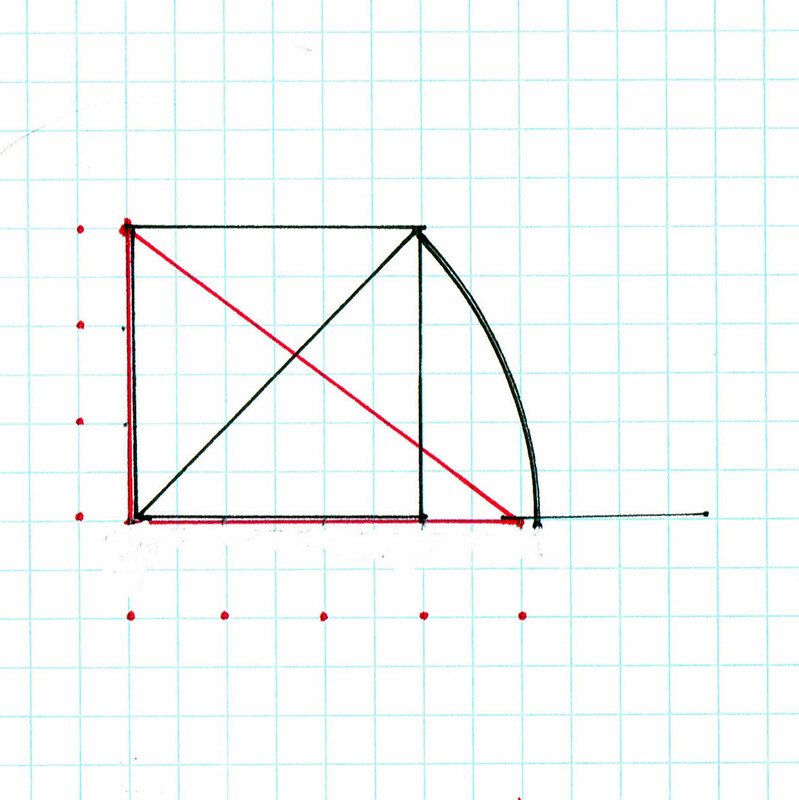 The diagram here shows the difference geometrically : the triangle is marked off in red, the ratio (a square and the length of it's diagonal) in black. For the Root-Two Rectangle to equal the triangle, if the side were 3 then the diagonal of the square would have to equal 4. It doesn't. 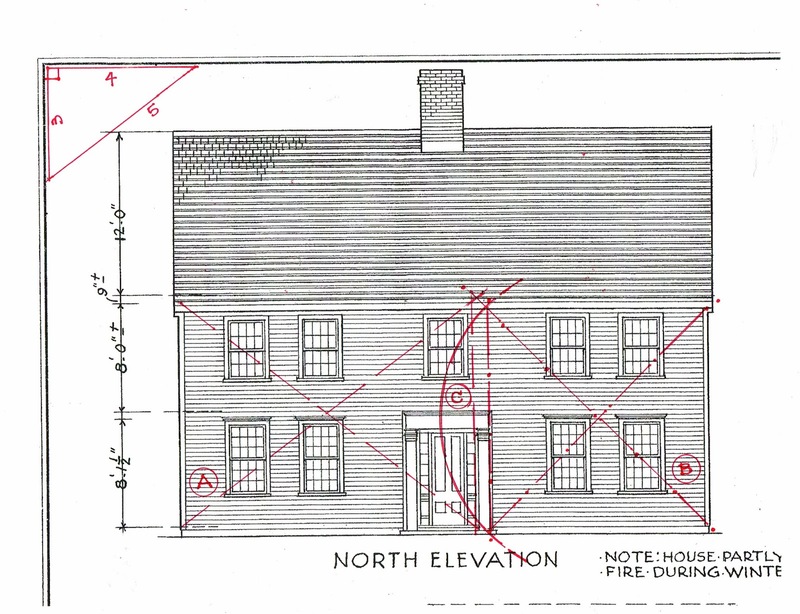 I think the evidence is too strong that the house-wright was using the 3-4-5 triangle to put together a traditional looking house. The fact that circle geometry almost works is just that - it is almost the same. But it isn't. Please, excuse me. It appears you may have made an error in the last steps of your analysis. You state "the Golden Section (a square and the length of it's diagonal) in black." I believe this is the geometric definition of the root ratio - the square root of 2 or approximately 1.414. Since the Golden Section is approximately 1.618, wouldn't using it have show an even larger difference than you indicate in the post? Thank you for taking the time to write these posts. I was not careful enough. 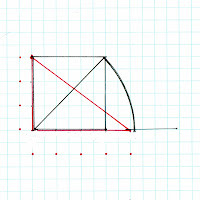 I find the Golden Section is not often used, while the Root 2 rectangle is. Maybe it's easier? Thank you for the note. Thank you for reading my blog.